Shale Gas – an American Revolution? In a recent Wall Stree Journal article, “America’s Natural Gas Revolution,” Daniel Yergin and Robert Ineson opine that gas produced from shale “is already changing the national energy dialogue and overall energy outlook in the U.S.–and could change the global natural gas balance.” Mr. Yergin is the author of “The Prize: the Epic Quest for Oil, Money, & Power” which won him a Pulitzer Prize. He is now chairman of IHS CERA. Mr. Ineson is senior director of global gas for IHS CERA. — Production of gas in the lower 48 states increased 15% from the beginning of 2007 to mid-2008 – an increase fueld mostly by shale gas discoveries, and an increase that is more than most other countries’ total gas production. — Proven gas reserves have risen from 177 trillion cubic feet in 2000 to 245 trillion cubic feet in 2008, even though the U.S. produced nearly 165 Tcf during that time. Most of this new gas comes from shale plays, beginning with the Barnett Shale in North Texas, and including the Haynesville (Louisiana and Texas), Fayetteville (Arkansas), Marcellus (Pennsylvania and New York), and most recently the Eagle Ford in South Texas. Shale gas is made possible by use of horizontal drilling technology and newly developed hydraulic fracturing completion techniques. 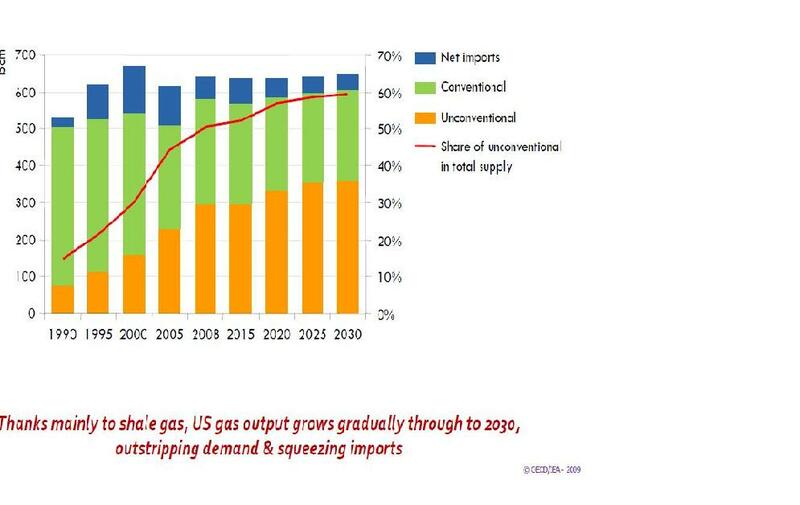 The authors believe that this new gas supply will dramatically impact the way the U.S. generates electricity. The U.S. now largely relies on coal for electric generation. New climate regulations and gas’s increased availability will increase the use of gas in electric generation. Gas is cleaner and emits less carbon dioxide, and gas-fired power plants can be built more quickly and more cheaply than coal-fired plants. As more jurisdictions mandate higher percentages of generation from wind and solar, which are intermittent and unreliable, gas plants may be built to provide the base load needed to make up the difference. Natural gas may also become the fuel of choice for truck fleets and busses, and eventually passenger vehicles. Yergin and Ineson downplay the environmental risks associated with shale gas development. They say that the risk of groundwater contamination from fraccing of wells is small, and the amount of water used in completing wells, while significant, is less than the amount of water used by other types of energy production. — Over half of global gas reserves are located in three countries: Russia, Iran and Qatar. — The global recoverable gas reserve base is estimated at more than 850 trillion cubic meters. Unconventional gas resources, mainly coalbed methane, tight gas and shale gas, make up about 45% of that total. So, suddenly the U.S. is awash in natural gas. This increased supply, combined with the recent recession, has driven the price of gas down significantly. Congress appears to be pushing for increased use of natural gas as fuel, consistent with its goal of reducing global warming. It remains to be seen whether the market will trust the long-term supply of gas as fuel and invest in its use.